The first day of the Boxing Day Test started with a toss win for India. 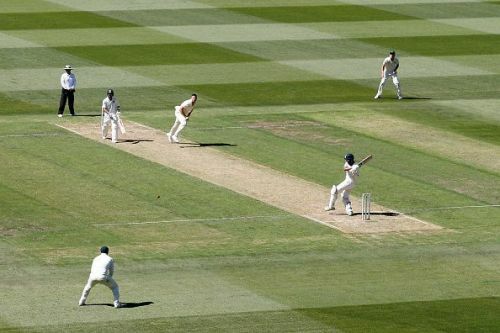 After winning the toss, captain Virat Kohli took no time in deciding to bat first on the green but hard surface of Melbourne Cricket Ground. Debutant Mayank Agarwal and replacement opener Hanuma Vihari started off the innings under the pressure to give India its first good start of this Australian summer. Vihari seemed to be struggling while playing as an opener and as a result of his awkwardness, he got out after scoring slow paced 8 runs in 66 balls. His partner and debutant, Agarwal seemed to be in good touch and played his strokes without any nervousness. Before getting out on 76 runs just before the lunch, Agarwal and Cheteshwar Pujara added 83 runs together for the second wicket which gave India a firm hand by the end of the second session of this Test match. In the third session, Kohli, who came to Melbourne after scoring a century in Perth, started off aggressively and by the end of the day, he remained unbeaten on 47 runs with 6 fours. Pujara, on the other hand, looked a class apart and succeeded to show us his great determination and grit once again. He added 68 runs in 200 deliveries which tells how responsibly he was building his own innings and ticking the team scorecard. None of the Australian bowlers, except Pat Cummins, succeeded to impress the home crowd at the greenish wicket of MCG. It will be interesting to see how Cheteshwar Pujara and Virat Kohli start their proceedings on day 2. The longer they play, the massive they score. For India, winning this test match is very important in order to take the series lead and therefore they need big partnerships from the later batsmen. After Pujara and Kohli, India need some good stroke play from Ajinkya Rahane and Rohit Sharma as well. For Rohit, it is the best opportunity to score good amount of runs to cement his place into the side. As this wicket is favoring the batsmen, we can expect some good knocks from the coming batsmen. For Australia, if they want to get back on track, they must take wickets and need to stop Pujara and Kohli to score big on day 2. As the game progresses, the rough patches will start to develop on the surface which will create some chances for Nathan Lyon to shine and help him to dominate this strong looking Indian batting line up. India will try to score in excess of 400 on day 2, with 8 wickets still left by the end of day 1.